This purse is made with durable black waterproof material, is fully lined in striped black on black material bearing the designer name, with an interior zip pocket, metal designer tag, leather drawstring closure covered by a flap with metal toggle closure. The bottom of the bag is leather, and there are leather strips down each side. The chain straps are made of clear Lucite with leather & buckles at the ends, and there is a large leather loop at the top of the bag for easy hanging or using as a handle to carry the bag. 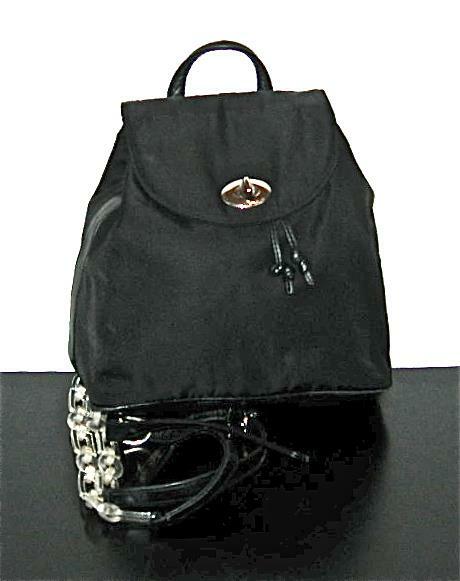 This purse measures approximately 9.5″L x 4.5″W at the bottom, 10″H not including the straps/hanging loop.